Sunday, April 14th, 2019: Palm Sunday – Rev. Canon Dr. William J. Danaher Jr. This sermon has been transcribed from live video. To view a video of his sermon, please click here. Over the past couple of months I’ve been thinking about this literary technique and psychological event called inadvertent or involuntary memory. It’s a moment in which you have a sudden remembrance of something that happened in your past and you draw upon that memory to start to feel the picture out in your present and future. Involuntary memory. In literature, we find it in Marcel Proust, Remembrance of Things Past or the Search for Lost Time, depending on the translation you trust. And in it the narrator who we never learned the name of, he’s eating a cookie that’s been dipped in tea, and the taste sends him back in time to a time of his childhood and it begins to fill in the picture of his life. And in Pixar’s Ratatouille, the animated film that’s my utter favorite in the world, there’s a moment in which the food critic, Anton Ego, goes to the restaurant by Gusteau’s, and he has ratatouille prepared for him, ironically, by a rat who happens to be a chef. And Ego takes a taste of the ratatouille and he suddenly goes back in time to the moment in which he’s a little boy coming in from a mishap and feeling sad and lonely, and his mother puts a bowl of ratatouille in front of him and he takes a taste of the ratatouille. And that memory of the Ratatouille is brought on by the taste of the ratatouille and the French restaurant, and suddenly Ego experiences a moral transformation. He no longer is a defender of the old alone. He has become, he writes, a friend of the new. Memory is an incredibly important thing. And when we have these involuntary memories, they’re meant to reveal something powerful about us. Memory is a kind of moral exercise because even when we receive memories that are involuntary or voluntary, they leave us with a kind of responsibility, a kind of decision about whether or not to tell the truth, or whether or not to see a complex truth around us. When I was 24, I had one of these moments in which you have the kind of nesting egg of memory. I had just finished my first year of seminary, and part of the responsibility that you have after that first year is to go and serve in a hospital or in a nursing home. And I picked an incredibly difficult hospital. I picked Children’s Hospital in Northeast Washington D.C. And I wanted to be challenged. I wanted a hardship assignment. And in the 1990’s, this was certainly that. Children’s Hospital was a place in which there was incredible poverty and violence in the surrounding community, and it was also a place of research . It was a place where people would go when they had nothing else that they could turn to and they needed some special intervention. And so, I would take the train down from Alexandria, which was a suburb of D.C. in the west. And as I would take the train down, we would hit the center of D.C. and all of the people wearing suits and nice clothes would get off the train to go work at the capitol or in one of the ancillary governmental offices. And then people would get on the train who were people heading to Northeast D.C., and these were people who had spent the entire evening cleaning the offices where these people worked. And then we would get off of the train and I would walk to the hospital through some incredible blight. And this was an incredibly difficult posting. My first couple of weeks, I was stationed at the adolescent wing. And that was where I was going to be for the summer. And I encountered two sets of patients, primarily. I encountered, primarily, white patients who were in their teens and early 20’s and were dying from cystic fibrosis. And then I encountered, primarily, African-American children, and youth and young adults who had been shot during the gang violence that was happening. During that time, the drug dealers would send young people around and would arm them with their drugs, and then they would not get attacked by the police, or they wouldn’t get apprehended by the police. And so, what happened is there would be a turf war and someone would shoot the children. And so these children were in there and I would have to go visit them. And we were placed on these wards without any training at all. We were just kind of put out there and we were expected to somehow make our way and figure it out. And after two weeks, we finally had a training session. And they gathered the group of chaplains and they brought in an Episcopal priest, and she handed out construction paper to us and crayons. And she said, “I want you to draw a God.” And next to me was one of my colleagues. He was a Franciscan monk. And he turned to me and he said, “You’ve got to be kidding me.” He had been serving in the neonatal unit and he had seen incredible sadness for the past two weeks. And so, uncharacteristically, for his order he just began to rebel. He drew stick figures. And he totally – and then he threw down his crayon after a few minutes. He was not going to participate in these shenanigans. But I had one of those involuntary moments of memory. I saw the construction paper and I had the crayon. And I started to draw this incredible picture that filled out. And in it there was the moon in the center, and there were trees around it and it was a snow-covered field. And I suddenly realized that for me I became aware of God when I was about 11 years old. My family was trying to make a step up, and so we had sold one house quickly and were trying to build another house. And in the in between, we were staying at this little cottage that was right outside of town. And the cottage was inadequately heated and we had to build a fire every day. My father was traveling. My brother was at college. So it was my mother and me living in this cottage. And I was suddenly taken out of the neighborhood where I knew everybody and placed in the middle of nowhere. And my mother was suffering from depression. All of our earthly belongings were in that cottage and it was cramped, and she would kind of let me go. And so on weekends, I would just go and I’d walk the trails. And somehow, I always made it home. And somehow, when I would come home it would be dark because of the time change. And I would look, and I would see this moon and I realized in that moment that I was never alone, that God was with me. And yet as powerful as that presence was, that sense of God’s presence in my life, that cottage also was a place of incredible unhappiness and sadness in my family’s history. My parents were going through a difficult time. My brother was ready to leave home. And when he came back, he and mother got into a horrible fight in the basement of the cottage where they were moving this huge door and the door fell against my mother and cut her leg horribly. I think my brother may have thrown the door. And I was afraid. There had been a bit of domestic violence in our family and I was terrified that my brother was going to beat my mother. And he was seven years older than I was. He was an athlete. I was 11 years old. And so I went into the gun cabinet and I loaded a gun, and I went into the basement and I confronted them. And this seemed to stop them. And there was this quiet moment. And my brother said, “Give me the gun.” And I unloaded the gun and I gave him the empty gun. And then all three of us just went to bed. We just went into our rooms, into our separate corners. And I remember sleeping that night in my jeans so I could keep the bullets in my pocket because that somehow made me feel safer. And I remember being aware, for the first time, just how damaged my family was and how alone I was. And that was an incredibly God-forsaken feeling. And so that picture that I was drawing as I was sitting around that table of other chaplains, when I drew the moon, I realized in that instance that my relationship with God, that experience of God’s presence had won. That the moon was there. That God was there. That God’s presence in my life was greater than any absence that I would ever experience. And suddenly by having that step back in memory, I was able to find the training I needed to have compassion for every child I experienced on that floor. Because that moment in which I recognized my own violence in my family provided me with waves of compassion for anybody who had perpetrated or suffered violence that I met. And that moment in which I realized that I was from a family that was incredibly broken and there was nothing I did to deserve that, I realized that I could somehow reach out to those adolescents who had been born with a congenital disease, that would mean that they had a very short life. And most importantly, I had an image of the moon. I knew that God was present even when we experienced God’s absence most powerfully. Memory is an amazing thing. It can help you develop your resources. It can help you see yourself differently. It can help you go forward into a world in which there is uncertainty and danger. And it’s for that reason, I think that we continued to refresh the memory of Christ’s death and resurrection; every Palm Sunday, every Holy Week, every Good Friday, every Easter Day. Because by stepping back into that dangerous memory of Christ’s movement through to Jerusalem, His betrayal, His death and His resurrection, we are invited to have our own memories made green again. To step back voluntarily, not involuntarily, into that time period and to see ourselves differently, and to see the presence of God even in those places where we see God is absent, or we fear God is absent. This interaction between the presence and absence of God, it’s not a philosophical concept. It’s actually the message of the cross itself. It’s the paradoxical truth of Jesus Christ dying on the cross, which is that God’s presence is powerful enough to be present even in absence. And certainly, everything we have just heard beautifully chanted from the gospel of Luke is meant to convey that God was present in Christ even in the midst of horrific violence. And so Jesus says, “Father, forgive them,” when He is mocked, and whipped and crucified. And Jesus promises the thief, “Today, you will be with me in paradise.” And the people who have seen this horrific public execution, walk away convinced that He was innocent and grieving. Everything in that gospel passage is meant to remind us that in the midst of absence, God is present in Christ. Holy Week is an opportunity for you to step back into the dangerous memory of Jesus’ death and life by plumbing your own dangerous memories. And by looking back at those places where you see and fear that God was absent, you begin to actually see and remember differently, and to see how God in Christ, through His suffering, was present. The art piece I have for you today is from Sally Mann. It’s called Deep South or Scarred Tree. Mann did this in 1991. It was her attempt to tell a dangerous memory of her own childhood. Mann is from Virginia and she would spend a lot of time in some of her early art talking about and showing images of her family which had been there for generations. And like many white southerners, she wanted to show how melded with the land and with this history that her family was. In this Scarred Tree, she begins to tell an even more dangerous memory, which is that that family history had been cemented around acts of horrific racism and violence. Scarred Tree is meant to evoke lynching, the practice of taking someone who is African-American and making a spectacle of their death by hanging them from a tree. And for generations during the lynching period from the 1920’s and the 1940’s, white photographers would take pictures of these dead African-Americans and make them into postcards and sell them. It was a way of somehow maintaining power. Lynching was named after a judge Lynch from Virginia. 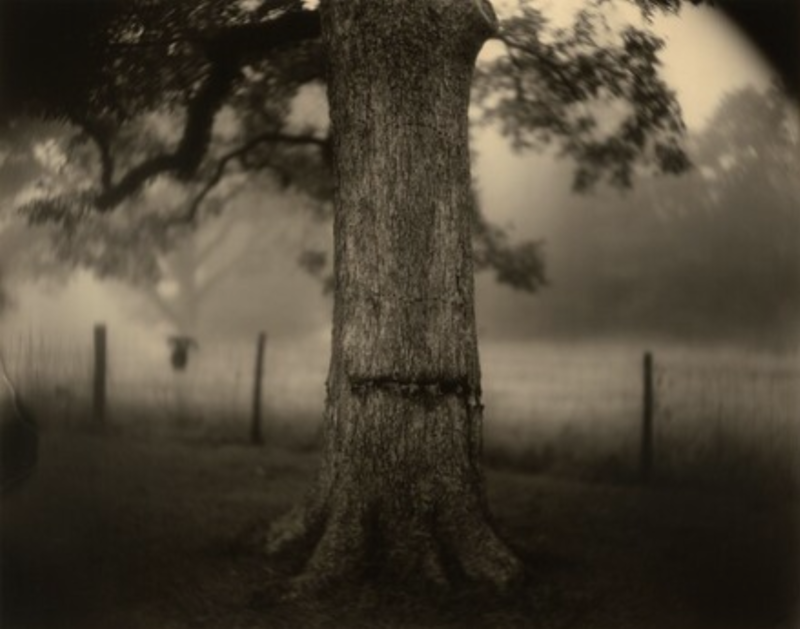 So Sally Mann who is from Virginia, this is a story that she is telling, a dangerous memory of her family. And yet, even as she tells this story of absence, photographically, you can see an image of God’s presence; a redemptive promise is emerging. Because though this tree is scarred, and the landscape is bearing witness against her family, the tree is still alive. The scar will not kill the tree. And this is a reference to the power of life over death that comes to us in Jesus Christ. And unlike many crucifixes, and this is a crucifix for me in many ways, this Holy Week, there is no body on this tree. Because just as what we do in the Catholic or the Protestant church, we tend not to put a corpus on our crosses because that’s a reminder to us that Christ is raised from the dead, that death will not overcome Him, that He had victory. And so will we through Him. And so in the same way, there is no body on this tree. The tree is a witness to the life that is greater than death, to the love that defeats violence, to the presence of God in the midst of the seeming absence of God, of the moon shining and promising that each of us is surrounded by love. This Holy Week, what will you remember?